Our website is available to assist you 24 hours a day, seven days a week, and we hope to address your questions and concerns in the most efficient manner. For your convenience, we have compiled a source of Frequently Asked Questions (FAQs) that may already have the answers you are looking for. Do you want to check the status of your order? If so, please visit our Status of Order page for information. Should you need additional assistance, you may contact us by telephone. StyroTrim.com does not accept telephone, fax or email orders. All orders are processed online. It is NOT necessary to open an account in order to receive a price estimate, visit our Product Showroom. E-mails and Faxes: Available to registered account holders only. You must log in. Any items not found in Styrotrim's extensive catalog will be considered a CUSTOM ORDER and MUST BE SUBMITTED through our CUSTOM ORDERING SYSTEM available only for REGISTERED customers. No pricing is given over the phone. Custom orders must follow the custom ordering rules, will require a minumum quantity order, and will be subject to approval or rejection. StyroTrim.com has hundreds of quality products to choose from to help with your project. Please refer to these frequently asked questions to save you valuable time and get your questions answered immediately. How do you ship StyroTrim products and what is the cost? StyroTrim products are shipped by the most economical freight service possible. When you place your order, the shipping cost - based on volume, weight and destination - is automatically calculated. Due to the complexity and uniqueness of your particular order, StyroTrim has programmed its own shipping calculator, based upon historical data and our vast experience of shipping building products. The cost of shipping appears in your online order form for you to review before you place the order. Most Styrotrim products take a minimum of 8 to 12 business days (except QuickShip orders) to process an order (prior to shipping). Please note that additional time is required for all smooth coat finishes. Once the order is processed, it generally takes two to five days to arrive. Can I pick up my order in person and skip the shipping? Yes, you are welcome to pick up your order at our Sacramento location. You will be sent an email when your order is ready for will call. 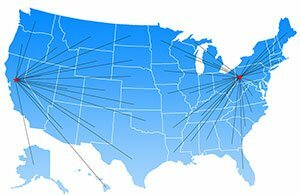 The StyroTrim company headquarters are located in Sacramento, California; however, we ship nationwide directly to our customers. Is there a StyroTrim dealer in my area? All orders come from our Sacramento facility at this time. Our catalog is available to registered account holders. You must log in.- our Showroom of products -is currently available at StyroTrim.com only. You can print the catalog directly from our website. Please visit the website frequently to view our current or new line of products. Can anyone install StyroTrim products? Yes! All StyroTrim products are designed for easy handling and installation. Whether you’re an experienced craftsman or a do-it-yourself novice, our four-step installation process is easy and quick. What type of adhesives do you recommend for the trims and accents? We recommend 100% clear silicon or exterior liquid nails. Note that our StyroCaulk is a filler caulking, not an adhesive. I am using Hardy Board. Will this work? Yes. StyroTrim accents can adhere to any surface. My house is made of brick. Will this work? How can I check the status of my StyroTrim order? Log into your account and click on Status of Order. Can I call in or fax over my order? All ordering, price quotes, and shipping status information are provided online. We do not accept phone, fax or e-mail orders. How do I find out the price of an item? It is NOT necessary to open an account in order to receive a price estimate, visit our Product Showroom. Then you can get a free quote by creating the quote on StyroTrim.com. Quotes remain in your account for up to 6 months. Are StyroTrim accents priced by the length? All StyroTrim accents are priced by 85" lengths or by unit. Yes. When you create a new account on the StyroTrim Web site, you must specify your contractor status. After a brief waiting period to verify your contractor's license, you can log back into the site and receive an automatic discount on all orders. Do I get a discount for volume purchases? Contractors, dealers and resellers receive discounts for volume purchases. When you open a new account at StyroTrim.com, select the appropriate category. Once you receive your account confirmation, you may log in and place an order at your category pricing level. What colors do StyroTrim accents come in? StyroTrim accents arrive at your door ready for you to paint in the color of your choice or color-coat by a stucco contractor. Can I get a sample of StyroTrim? Yes. Open an account then log in. On the bottom left side of the member area is a link to request a sample. StyroTrim comes in three finishes. Single coat is ready for a stucco color-coat. Double coat is already covered with a stucco coat and merely needs painting. Smooth coat is as the name implies - the finish is smooth like cast concrete. StyroTrim accents are made from expanded polystyrene, covered with our unique, alkali resistant reinforcement mesh, and then our own specially formulated copolymer cement coating is applied, making the product ready for painting. Do you have Technical Specification Sheets available for the different products? Is there any kind of warranty available? StyroTrim is the only manufacturer of foam trims that back up their products with a full Lifetime Warranty. For full details, please go to Warranty. Will StyroTrim withstand extreme temperatures and adverse conditions? Yes. StyroTrim products are made of expanded polystyrene, polymer mesh and copolymer cement. Once completed, the product is virtually indestructible and will withstand extreme temperatures and adverse conditions. StyroTrim products will more than pay for themselves in longevity. As opposed to wood, StyroTrim products will not warp, rot, mildew or be eaten by termites so never need to be replaced. No. StyroTrim shapes are architectural treatments only and not in any way to be considered load bearing structural appendages. I'm adding on a new roof. How much is the overhang for the trim? The overhang comes in different sizes for the different trims. Please visit our Easy Install page for the appropriate measuring and installing instructions. Can I install StyroTrim accents on my fireplace mantel? Yes, StyroTrim accents can be installed on a fireplace mantel. I would like to install pediments over my windows but I don't see any in your catalog. StyroTrims are extremely versatile and may be used to create your own design of pediment. Simply select the desired profile and sketch it out on paper to determine the angles at which you cut the trim and the lengths of the trim. StyroTrim products can be shipped anywhere in the nation. To ensure that your shipment arrives safely, all StyroTrim products are carefully packaged by hand to minimize damage in transit. Each order is evaluated for the most cost effective shipping method in order to keep your delivery costs as low as possible. When you place your order, the shipping cost - based on volume, weight and destination - is automatically calculated by Fed Ex. The cost of shipping appears in your online order form for you to review before you place the order. A standard order is processed within 8 to 12 business days prior to shipping. Once the order is shipped, the order arrives within two to five days. For quicker processing, we also offer Quick Ship service on select products. If you wish to receive your Quick Ship products first and can wait for the remaining products via standard delivery, you must complete separate orders (separate shipping charges apply). For more information on our delivery services, please go the Nationwide Shipping page or call our toll-free number at 888-398-5353. To track the status of your order, log on to your account page, then click on Status of Order. From here you receive information on where your order is in the delivery process and estimated time of arrival.